Cabin crew at Icelandair have given a new meaning ‘waiting in the wings’ as they prepare to put on a live theatre show for passengers at 39,000 feet! Bosses at the airline are set to trial the unique in-flight entertainment to mark the carrier’s 80th year, with flight attendants sent to stage school to learn various elements of thespian arts such as singing, dancing and comedy. And this September, lucky passengers on a flight from London to New York via Iceland, will catch the opening performance – a live, three-act, theatrical performance in mid-air. The airline launched the initiative following a global survey of 9,000 air passengers in the UK, US, Canada, Scandinavia, France and Germany which found 52 per cent end up ‘bored’ during a flight. Birkir Hólm Guðnason, CEO at Icelandair said: “The world is changing the way we fly, and as such there is a requirement for airlines to up their game to meet the demands of this new breed of flier. “The shift in passenger expectation means they now demand both better customer service and more unique entertainment. We know our talented staff are the stars of the company and at the heart of the passenger journey, so we ran a stage school to nurture their skills and improve customer service. Icelandair partnered with an immersive theatre group to create the unique three-act play starring the airline’s staff. The show will transport passengers from 1937 right through to the future, all on one transatlantic flight from London to New York via Iceland. It comes after the company’s research found travellers are looking for more of a human touch on their journey. It also emerged 78 per cent admitting cabin crew can ‘make or break a flight’. Four in ten even said a cabin crew member has gone out of their way to entertain them on a flight, by doing things such as telling jokes, amusing children and even teaching them some of the local language of their destination and they crave more of this. And a third would be more likely to choose an airline that offered free live entertainment as part of their in-flight programme. As result, Icelandair is inviting passengers to transform their boarding pass into a Stopover Pass, offering them access to series of entertaining performances. This will give them access to a range of performances featuring Icelandic talent and gifted Icelandair staff. Guðnason added: “In our 80th anniversary month we’re proud to introduce our free performance series, Icelandair Stopover Pass. The research findings show there is an opportunity for us to transform wasted time into time well-travelled. 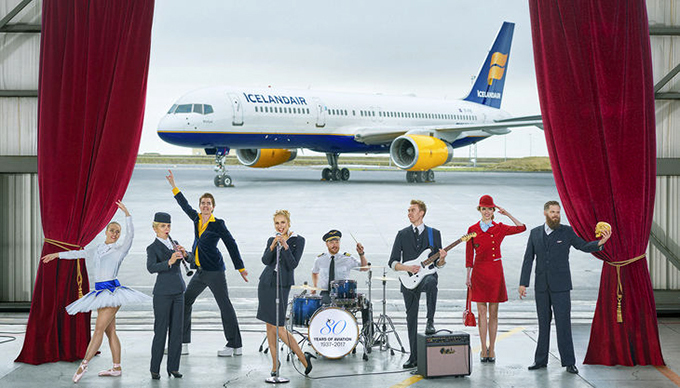 The live in-air entertainment kicks off a series of performances throughout the year celebrating 80 years of Icelandair. You can also watch a video about the Icelandair Stopover Pass below.